For quite a while we were lost in our mania over Through the Ages as it is a spectacular game that feels like classic Civilization captured in a board game. Have I reviewed that game yet? Ack, maybe I haven't. Better address that soon. Anyway, one of the games that now competes for Through the Ages time is Terraforming Mars. The game is rather compelling given the relative complexity of the game's strategies yet the generally straightforward approach of the game rules. Repeated plays have revealed different potential strategies and paths to victory and quite the rewarding experience as well. As much as the card art can leave something to be desired at times, the game itself is a true gem and one that scratches a particular niche for tabletop strategy games. 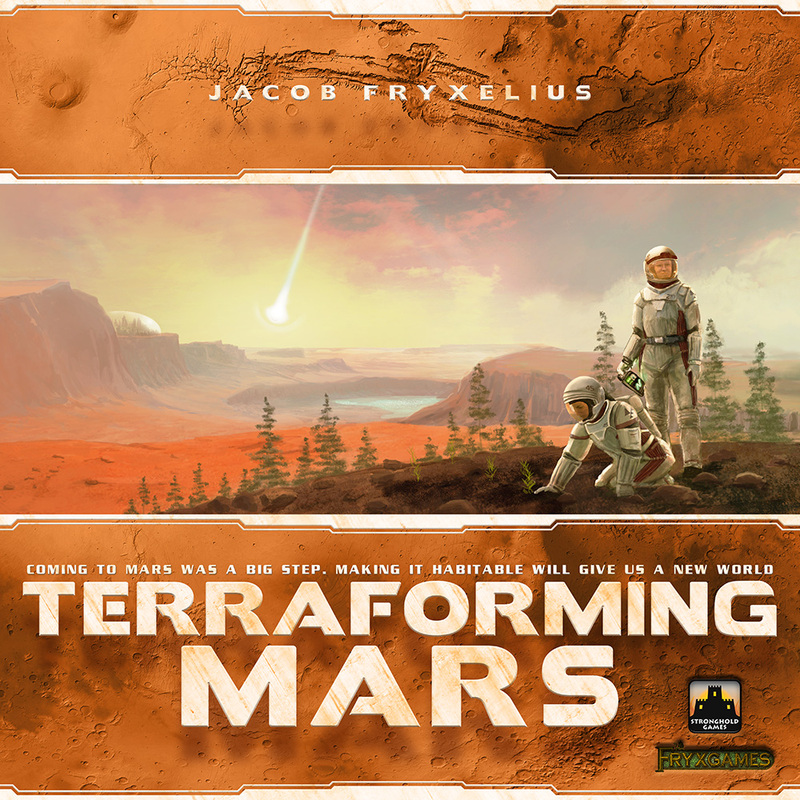 Terraforming Mars is a strategy game for 1-5 players designed by Jacob Fryxelius and published by FryxGames. The game has of nominations an awards from various groups given its initial release. In the 2400s big corporations have taken on the challenge of terraforming Mars for human habitaion as commissioned by the World Government of Earth. Players represent different corporations each with their own specializations. 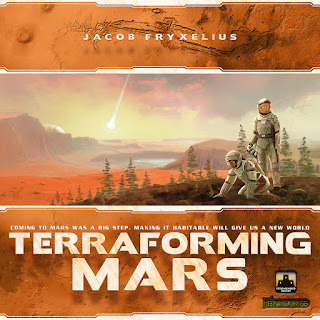 Progress in the terraforming effort is measured by one's TR or Terraforming Rating and this is typically raised by increasing the temperature of the planet, increasin the oxygen level or adding ocean tiles to the hexagonal map that represents Mars. Players take turns purchasing cards to use from a random card draft and then playing them by paying the associated costs. These help players build up resource production across various areas like steel, titanium or even plants in order to aid with their terraforming efforts. Plays can also create cities on the planet's surface or possibly on some of the moons of Mars for other resources. Once the planet has maxed out temperature, oxygen and has run out of ocean tiles, players complete scoring and the corporation with the highest TR wins. What I Like: The game is brilliant in its diversity between the different corporation abilities and the fact that the all project cards in the game are unique, and thus it's hard to develop a specific strategy until you have your next draft of cards in hand. As much as the card draft is an optional mechanic for more experienced playes, we now find it to be a great addition to the overall game experience. And thus every game feels unique as you all endeavor to make the most points while managing Mars. The balance between expected resource production, meeting the prerequisites or avoiding the limitations of cards while competing with other players for key space on Mars is what drives the game and you know that a lot of love went into the design of this game given the many instances when you find yourself short a resource or two trying to accomplish everything you want to do within a single term. It's also competitive but not overly so and thus the greater challenge is ensuring that your assets on Mars benefit you as best as possible. What Could Be Better: First, card art is a little inconsitent. Some are interesting photo images. Some are rather weird Photoshop creations. Some are tasteful vectors. Others feel like nearly random symbols. And it's a seemingly minor point aboutt the game and sure the gameplay is more important but given how much of the game centers around the cards, it can get a little tiring at times.At least most of the symbols are consistent enough for easy interpretation of how things work, but beyond that the game ends up feeling a little cheap. Hopefully it has beome successful enough to merit a stronger second edition or something. And depending on who you play with, there may be some frustation with the lack of more direct player-vs-player options. This is not to say the game needs more of this mechanic, but there are a number of cards whose effects can be perceived to be more PVP and the limited number of such cards makes the PVP moments stand out a bit more in a somewhat awkward fashion. For the most part you really need to focus on building your power base of sorts to get the game going and PVP stuff seem incidental and at times unnecessary. TL;DR: Terraforming Mars offers a distinct gaming flavor that is definitly a unique brand of strategy. Every game is different and will certainly challenge the players of your game table and the expansions that have come out for the game thus far continue to add a clever, fun vibe to things. Thus the game gets a full 5 objects falling out of the sky to hit Mars out of a possible 5.